My mother has sadly had to be admitted to a nursing home, so her 3 bed house has to be cleared in Grange-over-Sands before handing back to the landlord. Once we have removed her personal items and mementos the rest of the contents of the house can be cleared for recycling, charity shop or to waste. We hope to have removed all we need for mum by the weekend of 26 the rest to clear is a lot of items. 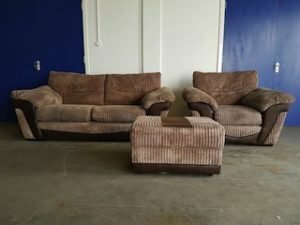 It’s mainly lounge furniture & bedroom furniture plus a garage that needs clearing. 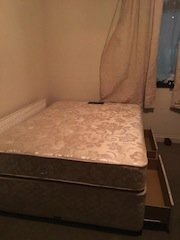 A double divan bed base on castors, with two drawers to one side, together with a matching double mattress. 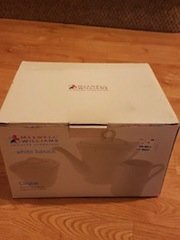 A brand new Max Williams three piece tea set, includes a teapot, a milk jug and a sugar pot. 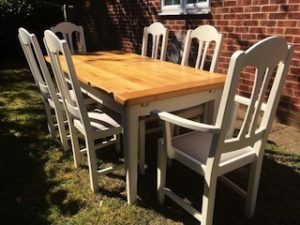 A hand painted white and solid pine rectangular dining table, together with six matching high back dining chairs, upholstered to the seats in mauve fabric. A tall standing silver Indesit two door fridge freezer. 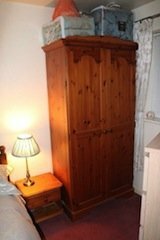 A tall standing solid pine double wardrobe, together with a matching one drawer bedside unit. 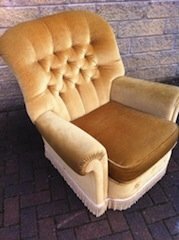 A vintage button back gentleman’s armchair, upholstered in mustard yellow velour with fringing to the bottom. 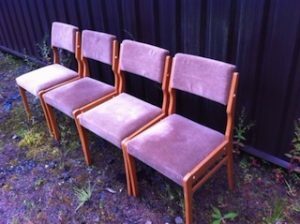 A set of four vintage solid wood framed dining chairs, upholstered to the seats and back rests in velour. 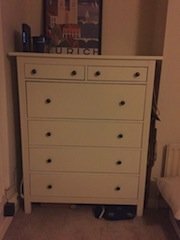 A hand painted white, solid wood tall chest of drawers, having two small over one large and three medium drawers. 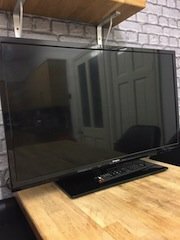 A black Polaroid 32 inch LED full HD ultra slimline television. 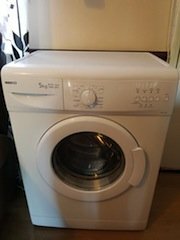 A white Beko under counter 5Kg 1000 spin washing machine. 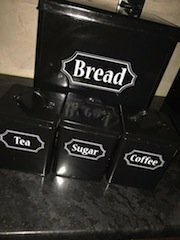 A set of four black tin kitchen canisters, to include a large bread bin and tea, coffee and sugar canisters. 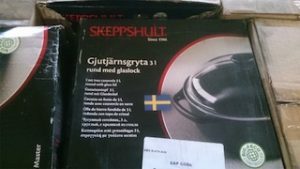 A brand new cast iron casserole dish with glass lid. A three piece sofa suite, comprising a two seater sofa, an armchair and a rectangular footstool, upholstered in chocolate brown leather and corded velour. 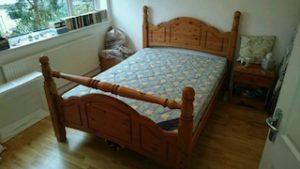 A solid pine double bed frame, together with a matching one drawer bedside unit and a double mattress. 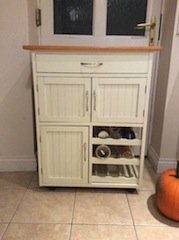 A hand painted cream, solid pine kitchen unit, having a large drawers above a double and single cupboard, and three wine shelves. 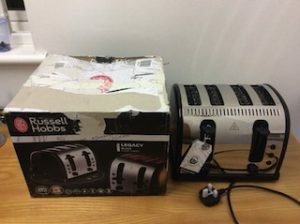 A brand new Russell Hobbs Legacy black and stainless steel, four slice toaster.